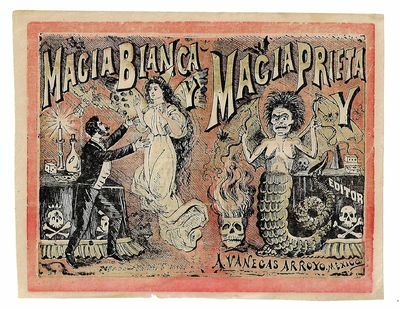 Striking three-color relief print (the black block is a relief etching on zinc; the red and green are relief engravings on metal) depicting a magician conjuring an angel on the left (magia blanca), and and a rather wicked looking winged mermaid beside a burning human skull on the right (magia prieta). 6.75 x 8.75 inches, probably the cover design for a book that was never published. A prolific printmaker, illustrator, and political cartoonist, Posada (1851-1913) was a highly influential Mexican artist. According to a biography from Stanford University Library, "Posada knew his intended audience well; most were poor, illiterate and enjoyed the sensational aspect of any story. Using well-known symbols, and with an uncanny journalistic sense, Posada was able to identify a hierarchy of interests for the common man: family, work, neighborhood, government, disasters, religion and the supernatural." Although he created thousands of book illustrations, he is best known for his calaveras-images of human skulls and skeletons used in celebration of the Day of the Dead (Dia de Muertos). "Because he worked mostly within a commercial sphere, much of Posada's work has been lost, and he died in obscurity. [He] was rediscovered, however, by the Mexican muralists of the 1930s, and since then interest in his surviving works has steadily increased" (Gale Biography in Context). The name of the printer with whom Posada was closely associated, Antonio Vanegas Arroyo, appears at the lower right of this print, and Posada's own name is on the lower left. One small chip to the lower margin, slight crease to lower right cover, else fine condition.